(l‒r) Nadia Cyncar, Tom Ward, Frances Swyripa, Natalie Kononenko, John-Paul Himka, Heather Coleman, Meaghan Patterson, Father Alexey Surayev, Elaine Harasymiw, Mike Luchanski, Karen Lemiski, and Roman Shiyan. 3 March 2015—On February 17, 2015 University of Alberta faculty involved in the Sanctuary Project held a workshop where they talked about the results of their work documenting sacral culture on the prairies. The purpose of the workshop was to connect the academy with the community and to facilitate interaction between museum personnel and church decision-makers who need to deal with sacred objects. The Sanctuary team sought to initiate a dialogue and to discuss how the Sanctuary data might be made most useful to interested communities. Present at the workshop were John-Paul Himka and Frances Swyripa, both from the Department of History and Classics at the University of Alberta, and Natalie Kononenko, Department of Modern Languages and Cultural Studies and the workshop organizer. Bishop David Motiuk represented the Ukrainian Catholic Church and Father Alex Suraiev represented the Russian Orthodox Church. Representatives of the Ukrainian Orthodox Church and the Orthodox Church in America did not attend. The Royal Alberta Museum was represented by Mike Luchanski, Head of Collection Services. Matthew Wangler and Tom Ward wore multiple hats as representatives of the Historical Resources Management Branch of Alberta Culture and Tourism. Meaghan Patterson, Executive Director/CEO of the Alberta Museums Association, was in attendance as were Khrystyna Kohut representing UCAMA, the Ukrainian Canadian Museum and Archives of Alberta, Elaine Harasymiw from the Ukrainian Museum of Canada, Alberta Branch, located at St. John’s Cultural Centre, and Nadia Cyncar from the Ukrainian Catholic Women’s League of Canada Edmonton Eparchy Museum, located at St. Josaphat’s Ukrainian Catholic Cathedral. Karen Lemiski represented the Basilian Fathers Museum in Mundare. The workshop was sponsored by a grant from the Killam Foundation through its Connection Program. 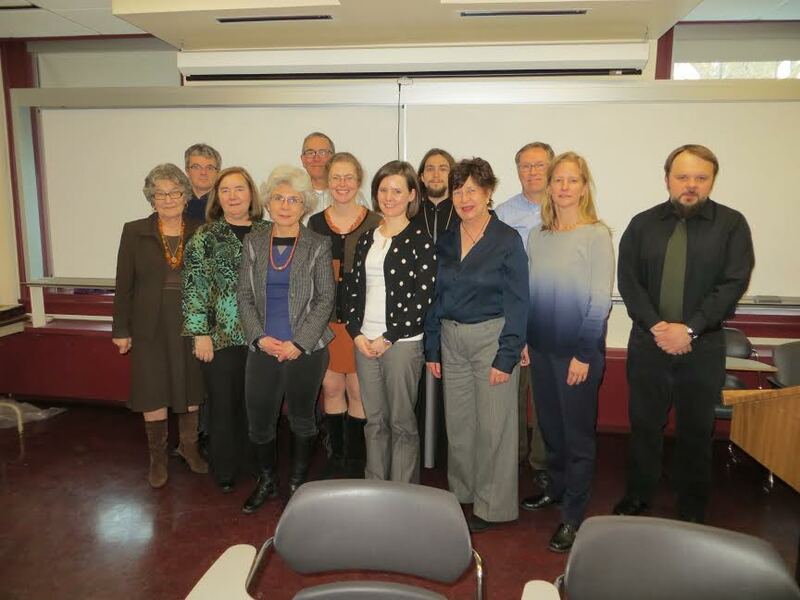 Additional support came from the Kule Chair in Ukrainian Ethnography and the Canadian Institute for Ukrainian Studies. The workshop began with opening remarks from Kononenko who spoke about similar workshops, one held earlier in Winnipeg and one planned for Saskatoon. Himka described the Sanctuary Project and its work. To date Sanctuary has conducted systematic photo documentation of Byzantine rite churches in Alberta and Saskatchewan, accompanied by interviews which describe ritual practices. The representatives of the clergy talked about issues such as preserving church records and maintaining religious devotion. Cyncar, Harasymiw, and Kohut gave historical information about their respective museums and described acquisition policies with Harasymiw pointing out that their mission was to collect items from Ukraine as well as Canada. The Basilian Fathers Museum in Mundare is unique because it does more than acquire objects to be used for display and research. The museum accepts all sacred objects, keeping a select few for the museum, sending some to churches that are in need of particular items, and destroying those items which cannot be kept in a manner that befits the fact that these are sanctified objects. The staff of museum and heritage associations offered information about themselves and the services that they offer. Many of the services could greatly benefit small local groups that need information about best preservation practices and policies to follow when the decision to donate to a museum is made. The afternoon was devoted to discussion and the formulation of workshop resolutions. The need to help rural communities and their parishes came up as a topic repeatedly and Swyripa and Lemiski will write a small guidebook outlining best practices for dealing with sacred objects. As the Sanctuary database is built and goes online, links will be made on that website to the resources provided by the Historical Resources Management Branch of Alberta Culture and Tourism, the Alberta Museums Association, and the Royal Alberta Museum, guiding interested parties directly to support services. The large museums attending the workshop appealed to the church communities involved to ensure that the appropriate authorities approve and sign the museum gifting agreements when a donation is made. They were encouraged to institute the use of internal release forms to help avoid conflicts over object ownership once the transaction is complete. An email list was compiled and circulated to help workshop attendees stay in touch. The need for continued dialogue is great, and the workshop was a first step toward meeting the spiritual and heritage needs of Alberta’s faith-based communities.